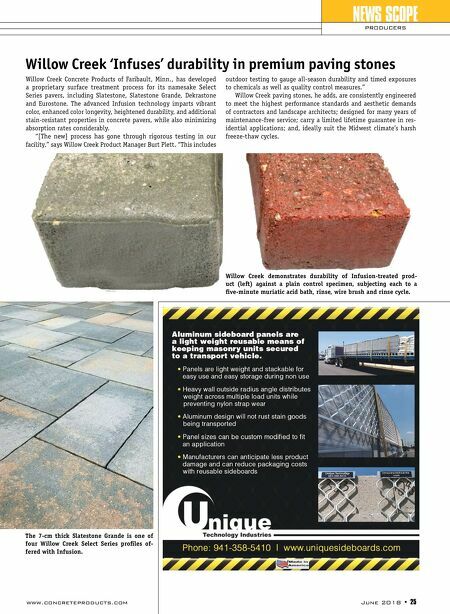 www.concreteproducts.com June 2018 • 25 NEWS SCOPE PRODUCERS Willow Creek Concrete Products of Faribault, Minn., has developed a proprietary surface treatment process for its namesake Select Series pavers, including Slatestone, Slatestone Grande, Dekrastone and Eurostone. The advanced Infusion technology imparts vibrant color, enhanced color longevity, heightened durability, and additional stain-resistant properties in concrete pavers, while also minimizing absorption rates considerably. "[The new] process has gone through rigorous testing in our facility," says Willow Creek Product Manager Burt Plett. 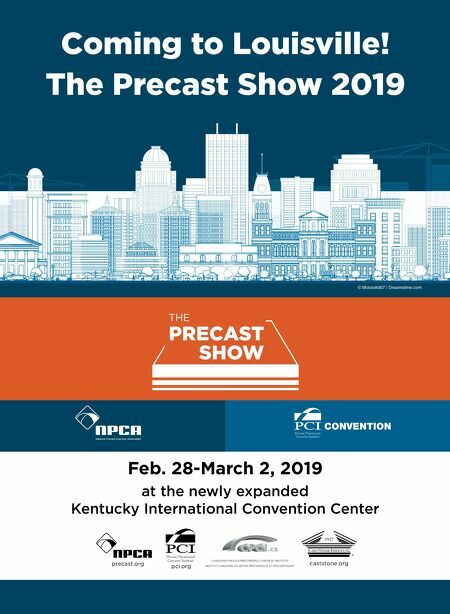 "This includes outdoor testing to gauge all-season durability and timed exposures to chemicals as well as quality control measures." Willow Creek paving stones, he adds, are consistently engineered to meet the highest performance standards and aesthetic demands of contractors and landscape architects; designed for many years of maintenance-free service; carry a limited lifetime guarantee in res- idential applications; and, ideally suit the Midwest climate's harsh freeze-thaw cycles. Willow Creek 'Infuses' durability in premium paving stones The 7-cm thick Slatestone Grande is one of four Willow Creek Select Series profiles of- fered with Infusion. Willow Creek demonstrates durability of Infusion-treated prod- uct (left) against a plain control specimen, subjecting each to a five-minute muriatic acid bath, rinse, wire brush and rinse cycle.